We are finally done with our master CLOSET!! Here is the before and after of my side. I found these jewelry boxes at Downeast Outlet store for $5 each. I think they look great in my jewelry drawer. Go here to see how we did the drawers. but could only find one. Super neighbor to the rescue. Shelley found two slightly larger oval frames for me. I spray painted them, of coarse. Then I replace the pictures with some scrapbook paper I had and finished them off with some vinyl. I got the vinyl from my great neighbor Shelly. They are the perfect detail. Go ahead and take them in!!!!! I also love my new shoe cubbie. We have so much more storage now. And it's custom to "our" storage needs. Plus I love it when my supper functional storage it so dang pretty. I'm pleased with my stenciled wall. My last post tells how to make your own stencil like I did. I got the great quadrafoil basket below on clearance for $7 at Home Goods. And the wood to build the boxes below that for free. These shots are a little different angle, but I wanted to show the whole stenciled wall. Call us crazy, but we took the door off. and it allowed us to use the wall space on both sides of the door. So that is my new closet! Do ya think it's over the top for a closet? Maybe, but I love it. And I get to go in there every day. In fact I keep sneaking in just to stare at it!!!! Any whoo, I would love your comments!!!! Very nice! You are so talented. Maybe you should be on TV. This is great, Ronda! We are about to undertake a closet re-do of our own (starting with popcorn ceilings, ugh!). Thanks for the inspiration! You are amazing!!!! I would LOVE a closet like that! You and Shelly have such beautiful homes! no wonder why you are friends!!! Your closet looks great! I love the stencil and the His & Hers signs. Way to go! This is such a great room. I have a teeny tiny closet in my guest room that I need to take the door off. It hits the bed. Your stencil idea is fab and I may just copy. Wow! It makes me wonder how much of the work your husband does. Wow, that's really really really nice! Much to be proud of! Love it! Excellent job and I'm so jealous of your organization!! I saw this over at House of Smith's, and I'm so in love. I thought you were using some expensive wallpaper and wondered where it came from, I'm so excited to find that it's a stencil, I'm so going to try this! Hi, I'm coming over from Shelly's. I'm so glad I did. This is gorgeous! I love the stencil, love the his/her frames, love your jewelry holder...love it all. I have been going through your blog...nice! I LOVE it! And I decided (when I finally started painting over the "you should NEVER it" wood in my house, that I'm now OFFICIALLY decorating for ME. So I say someday I might even do the same for my closet. You're right, you're in there every day, why not make it beautiful for YOU!! Great job!!! I'm a little jealous. Love the His and Hers signs. 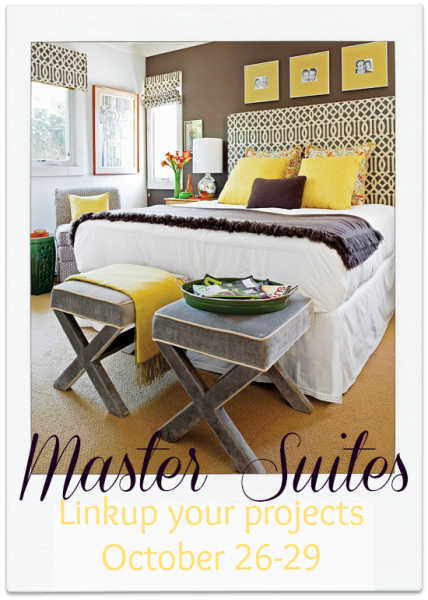 Your closet looks like a million bucks~well done! That looks fabulous! Did you stencil the walls? If so, where did you find the stencil?? I love it! Such wonderful ideas! The wallpaper, the "His & Hers"...Great re-do! I think if I had a closet that looked this good, I would just live in there! I can't believe you stenciled that wall! It looks just like wallpaper. You did an amazing job! Found you through Just A Girl... your closet it BEAUTIFUL! Love the shoe cubbies and His and her's signs! How creative! This is a beautiful closet! I love the stenciled wall and the his and her signs...visiting from Just a Girl! Your closet turned out great! I love the hooks and the his/hers - very cute. Thanks for linking up to Be Inspired last week. I remember your closet from another time...and still love it! Those "his" and "hers" signs just get me! I giggle when I see them and just think how sweet they are! Loving that stencil! GORGEOUS! Love the color! Amazing job! I cannot believe that is a stencil! I was going to ask you what the name of the wallpaper was and then I read it was a stencil and was blown away! Unfortunately, I am not talented enough to do something that neat...but it does get me thinking about wallpaper! Grea job! Those little signs are just too cute! Love your new makeover! I don't think it is too much...it looks great and functional...and like you said, you are in there every day. Good work! I think my favorite part is the his and hers hooks: very wise for clothes that otherwise seem to drape over whatever surface is available. Beautiful! I love the his and her signs, cute idea! 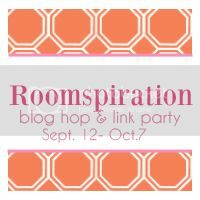 Thanks for linking up to Roomspiration today! I found you over at Roomspiration. You have just inspired me. I have been wanting to do something on the walls of my closet for a while. I am definitely going to stencil...maybe even later today (Lol - although I'm not sure I'm joking). I actually already have a stencil I bought a while back that looks very similar and I love the color you picked. I am now your latest follower. Your closet looks great! I love the stencil pattern you chose! Such a pretty space! Beautiful job! The stencil job in there it is great work. I almost thought it was wallpaper until read otherwise great job!!! I love the stencils against the white time. Looks very vintage cottagey. Gorgeous! I'm going to talk myself into trying this out (even though I'm scared to). I want paisley walls. I can practice it on another surface first, right? I wanted wallpaper and like you, don't want the sticker shock. Thanks for the idea!